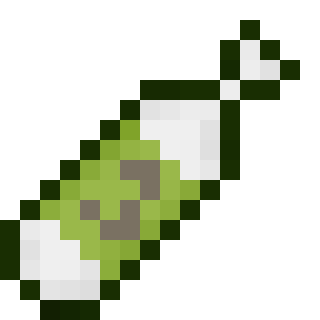 Capsule is a plugin which brings capsule items into Minecraft. With a capsule item, you can compress a volume of blocks into the item for storage, to be decompressed at a later time. The items in inventories can also be compressed inside of their block. You can craft a capsule using the recipe below. The slime ball can be changed to any other item in the config of the plugin. This will create a capsule of size 1, which will place inside of it a volume of blocks equal to 1 on each side. If you then craft the recipe again with a capsule in the center, it will increase that capsule's volume by 2 each time you craft it, up to a pre-defined limit set by the config. Right clicking on a block with an empty capsule in your hand will compress all of the blocks in a cube measuring x on each side into the item, where x is the size of the capsule. The block you right clicked will be centered on the first level of the cube of blocks stored, to give you an idea of which blocks will be stored. Inventories will also be compressed as well. The capsule will now have a very long lore, which shows that it is full. To decompress blocks, right click with a full capsule in your hand on a block. This will fail if there are non-air blocks in the area where the capsule blocks will be decompressed to.